Work by regional artists is featured on studio walls. 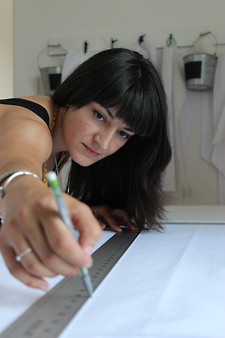 Kat Whitledge has always considered herself an artist. She started at a young age crafting and sewing with her grandmother. Kat studied painting, sculpture, and dance at Bennington College (VT) and went on to get her Master of Education degree at Antioch University New England (NH). The three places she considers 'home' are Corning, Arkansas; Cairo, Egypt; and Brattleboro, Vermont. Much of Kat's artwork has dealt with the topics of body-image, self-image, and women's issues. As she was struggling to find a way to bring these subjects and her artwork into a more tangible and public realm, she decided to refine her sewing skills in order to make custom clothing. Kat believes that no matter what size or shape a person is, they should have the option and the right to feel comfortable with their outward appearance. Kat sought out the opportunity to work with Nagada, a fashion design house in Cairo, because she was inspired by their ability to design and construct beautiful, well-made clothing for a wide range of body types. She was worked directly with the main designers and tailors at Nagada, then decided to bring those skills back to Vermont. 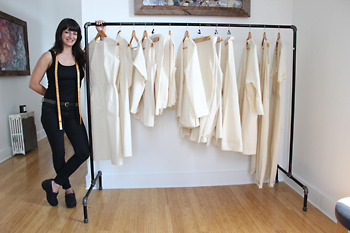 Kat stands beside a rack of her basic patterns. On the third floor of 17 Elliot Street in Brattleboro, Kat has created a very inviting atmosphere in which to greet her clients, develop and alter pattern designs, and construct one-of-a-kind garments. While the aesthetic is clean and minimal, she has managed to make the space warm and intimate. She openly offers tours of her process and space, which is unusual given the secretive and exclusive nature of most fashion houses. The space is open to the public during each Gallery Walk, where Kat also displays the works of 2D artists each month. Otherwise, individuals are asked to schedule a private appointment to discuss their personal clothing needs. During an appointment, there is an initial, casual conversation in which the client and designer get to know one another. Then the client can choose from a number of original clothing designs ranging from dresses to jumpsuits to jackets. 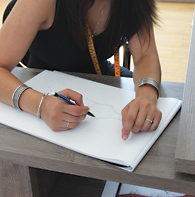 Once a design has been chosen, the client is measured and fitted to ensure a custom fit. Afterward, the client may choose from a varied range of fabrics that Kat has brought from Egypt. She also has swatches of fabric from U.S. sources and is open to working with fabrics the client might have previously purchased. People are interested in KWBB for many different reasons. Some clients are very invested in the 'slow living/slow fashion' movement and choose to support local businesses that help to grow our economy at home, as opposed to labor and materials that have been outsourced abroad in harsh working environments. Others have very particular clothing needs. Some are inspired by the original designs and prefer a personal and intimate shopping experience. Whatever the reason may be, Kat accommodates each individual's needs and believes that the interpersonal aspects of her business are equally as important as delivering well-made, timeless, custom pieces. As a brand-new, small business owner, Kat is feeling very supported by the community and is grateful for the joy and challenge of being able to work with her head, heart, and hands every day. Stop by this Gallery Walk (9/4/15) and enter the drawing for a handwoven Egyptian scarf. For further information, call Kat at (802) 258-0395 or visit online at the KWBB Facebook page: https://www.facebook.com/kwbasicsandbespoke.